It feels as though it was just yesterday that the world watched Prince William wed his long time girlfriend, Catherine Middleton. As the world watched the two become the Duke and Duchess of Cambridge, few expected what is now coming to fruition. As time goes, it is beginning to look like Prince William and his new bride are going to continue the legacy of Princess Diana, William’s late mother. The new couple has begun to work with charities and promote a caring environment throughout the world via their philanthropic ways. This weekend, the legacy grew. William and Catherine came to Southern California for the last few days. Sunday, which marked the final day of their visit to the Los Angeles area, saw the royal couple visit Skid Row. The neighborhood is one of the poorest in Los Angeles. 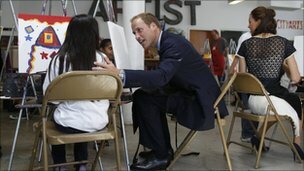 The Duke and Duchess began their day visiting children in Skid Row and taking part in their arts program at the Inner City Arts Center. William and Catherine joked around together to entertain the children and they praised the talents of the children. The couple touted the artwork of the children and encouraged their creativity. At the end of their visit, William and his wife put their hand imprints on the putty board alongside the handprints of the children. In the afternoon, the couple joined military families at a job fair. The fair was titled ServiceNation. Part of the reasoning for choosing to attend the job fair was based on improving the already solid relationship between the American and British militaries. At the job fair, 150 companies will be promoting roles with their organizations for the approximate 1,500 unemployed military veterans. The role of William in the military event is notable as the Prince is arguably the most famous member of any military in the world. For the last ten days, Prince William and the Duchess of Cambridge have been visiting in Canada and the United States. The trip has been the first of the couple to America since their wedding. The visit has improved the relationship between the royal family and the American public. For years, the loss of Princess Diana has left a hole in the international community. Now, with the beginning of the charitable and philanthropic efforts of the new Duke and Duchess of Cambridge, the gap left by the death of the Prince’s mother is beginning to fill up a little bit.